Fabio Aru (Astana) took his second stage win in the 2015 Giro d’Italia, on a scintillating day that saw race leader Alberto Contador (Tinkoff-Saxo) get into difficulty for the first time in the race’s final week. 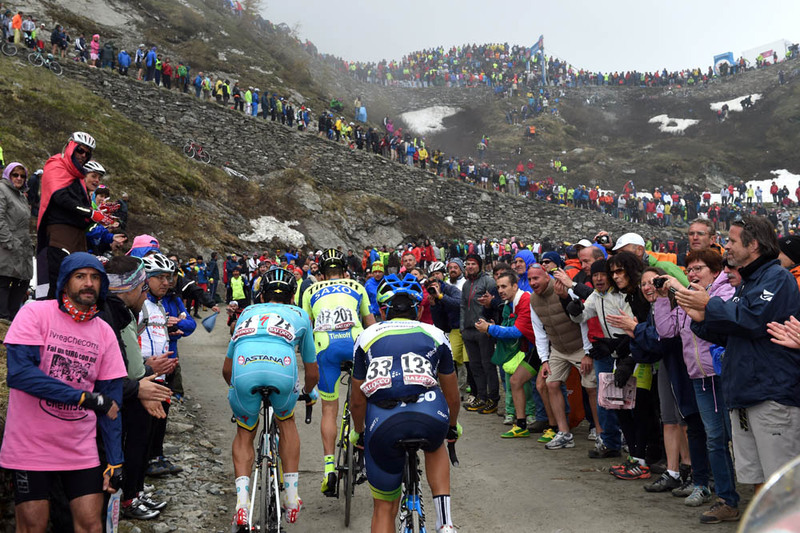 Contador found himself isolated during the day’s mountainous finale featuring the Colle delle Finestre and Sestriere climbs and lost nearly two and a half minutes to Aru on the line. However, having started the day with 4-37 over Aru, Contador’s race lead was never really challenged. Barring disaster on Sunday’s final, flat stage, Contador has won the race overall – his seventh Grand Tour victory. In recognition for his impressive recovery in the race’s final days, Aru will claim second place with Astana team-mate Mikel Landa in third. 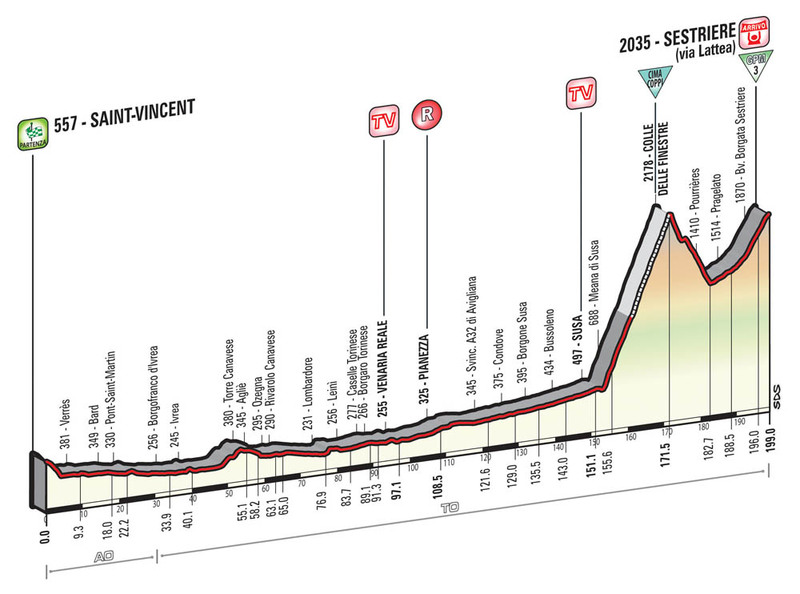 Given the fireworks in the final 40km, the day started sedately with a nine-rider escape group forming after 30km, comprising Marco Bandiera (Androni Sidermec), Julien Berard (Ag2r), Giacomo Berlato (Nippo-Vini Fantini), Nicola Boem (Bardiani CSF), Matteo Busato (Southeast), Jon Izaguirre (Movistar), Aleksejs Saramotins (IAM Cycling), Diego Ulissi (Lampre-Merida) and Ilnur Zakarin (Katusha). The nine riders were given only a short leash on the relatively flat run-up to the base of the Colle delle Finestre, with their gap closely marked at around two to three minutes. Berlato and Zakarin broke free from the escape group with around 45km to go as they hit the Finestre. The remaining seven escapees were quickly caught by the bunch, which was headed by Astana and Tinkoff-Saxo. As Berlato faded, Russian Tour de Romandie winner Zakarin went solo in the lead as Stefano Pirazzi (Bardiani CSF) launched an attack from the peloton. Astana massed at the front of the bunch for Aru and Landa, but Contador was left with just Michael Rogers for team support. Pirazzi couldn’t catch Zakarin, and was caught when Steven Kruijswijk (LottoNL-Jumbo) attacked from the peloton. Contador followed Kruijswijk and the contenders group was reduced to just nine riders, including Aru, Landa, Rigoberto Uran (Etixx-QuickStep) and Ryder Hesjedal (Cannondale-Garmin). Sky’s Leopold Konig and Movistar’s Andrey Amador were two of those caught behind in a third group, and ultimately lost time. 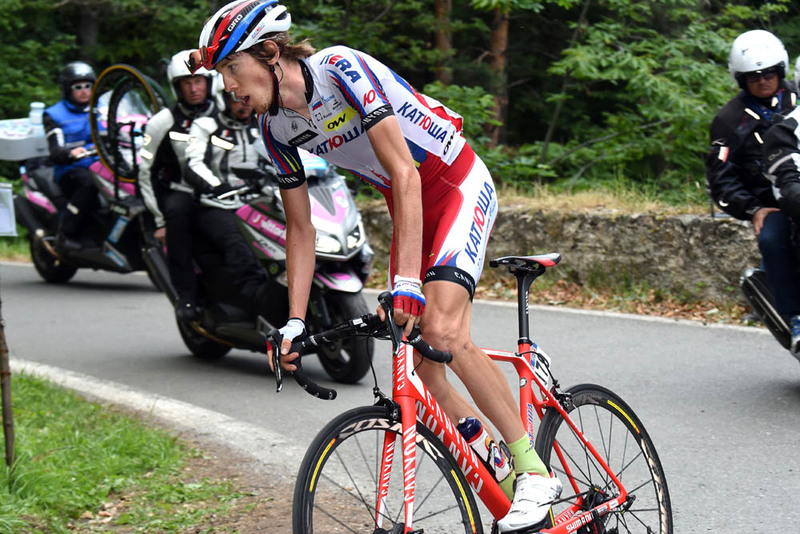 By the time the contenders’ group hit the gravel roads on Finestre, Zakarin was one and a half minutes ahead and did a great job in maintaining his distance ahead of the chasers until Landa attacked. Contador tried to follow Landa, but could not latch on to his fellow Spaniard’s wheel. Sensing that Contador was not on a good day, the other riders in the rest of the group attacked him, led by Hesjedal, and rode away, leaving him alone with several kilometres until the peak. Meanwhile, up front Landa had joined Zakarin, with Landa cresting the Colle delle Finestre first to claim the Cima Coppi, the prize for the first rider over the highest point of the Giro. Contador looked to be in difficulty, and rode over the top a minute behind the Aru/Hesjedal/Uran/Kruijswijk group before hitting the technical descent. Riding on his own, Contador somehow managed to limit his time loss to a minute before the final climb to Sestriere as the Aru and Landa groups combined, with the two Astana riders doing the pace-making and Uran, Hesjedal and Kruijswijk in tow. Aru then attacked in the final two kilometres. Uran followed briefly but couldn’t keep up the pace, leaving Aru to take his second consecutive solo victory. Just as he did the previous day, Hesjedal came home in second, with Uran in third. 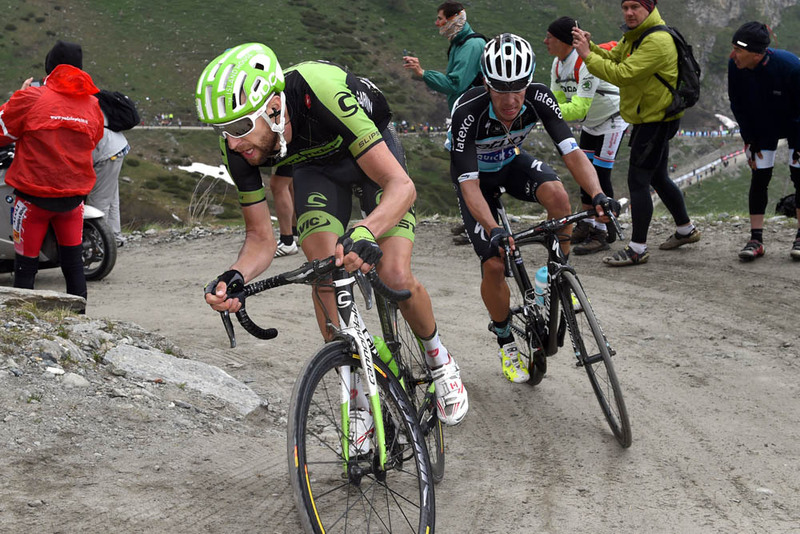 Hesjedal moved up to fifth place for his efforts, with Sky’s Konig slipping one place to sixth. Contador rolled in for sixth place, punching the air in recognition that he’d survived the final, punishing mountain test with just the last day’s procession into Milan to navigate before securing the victory.